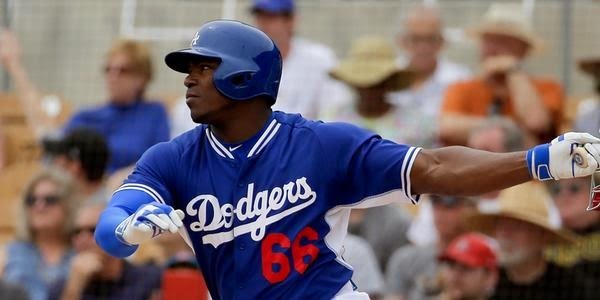 The Dodgers have once again dipped into the Cuban Baseball well. According to Ben Badler at Baseball America, they have just inked 25-year old Cuban right-hander Pablo Millan Fernandez to a minor league contract for $8Million - pending a physical. There had been minimal buzz on Fernandez in the international scouting community. In Cuba, the 6-foot-1, 185-pound Fernandez was known more for his touch and feel than his pure stuff, with a fastball that ranged from 86-88 mph at this time last year in Cuba. However, more recently Fernandez has increased his fastball into the low-90s, unusual for a pitcher in his mid-20s, with a curveball, slider and changeup in his arsenal as well. Like many Cuban pitchers, Fernandez intentionally threw from several different arm slots, though since arriving in the Dominican Republic to train he has worked to repeat his release point. Fernandez is expected to begin his career in the minors as a starting pitcher, most likely with one of the Dodgers’ upper minors affiliates. He had primarily been a reliever in Cuba while pitching for Holguin in Serie Nacional. During the 2013-14 season, Fernandez posted a 2.83 ERA with 36 strikeouts and 19 walks in 57 1/3 innings, with 26 of his 27 appearances coming out of the bullpen. His best season in Cuba came in 2011-12, when he threw 95 innings of relief as Holguin’s closer, with enough innings for his 1.52 ERA to lead the league, along with a 70-23 K-BB mark. This appears to be a good depth move by the Dodgers - and a timely one at that. All of the sudden the Dodgers are riddled with injuries on their pitching staff, so having a guy like this adds some needed breathing room if you're worried about our arms. Badler mentions that he'll begin his MLB career as a starter, but his background is as a reliever. I wouldn't hold out hope that he'll magically become a back-of-the-rotation starter for us, or a potential replacement for Ryu should his woes continue for the long term. On the other hand, if the finesse he is purported to have with his pitches translates into getting Major League hitters out, then who knows? Fernandez could be a diamond in the rough. I wonder if he's in camp right now in Arizona. Anyone know? In celebration of Fernandez's arrival to the Dodgers I made the above fantasy card for him. 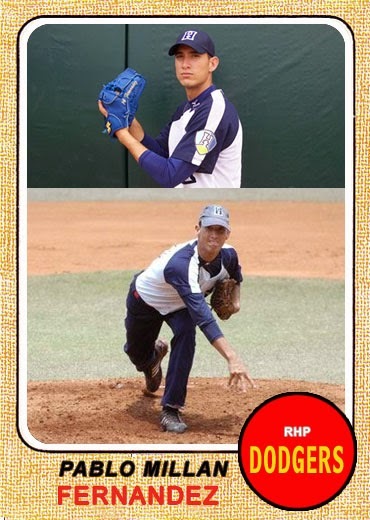 I combined two photos of him (from Cubahora and enCuba24h.com) and used the 1968 Topps Baseball card design. Below is a video of Fernandez pitching, found via Roberto Baly on twitter. BTW, Ben Badler's story linked above also includes a video of Fernandez pitching. SNAKE CATCHERS: The Dodgers, who have the National League’s best spring winning percentage at .625, take on the Diamondbacks for the first of two meetings this spring. Last year, the Dodgers dominated the Snakes, winning 15 of 19 games, including two in Sydney, Australia, and eight of 10 in Phoenix. This season, the clubs will square off during the campaign’s first month as the Dodgers travel to Chase Field for their first road trip, April 10-12. Arizona’s first visit to Dodger Stadium will come the next time the squads play, from May 1-3. One year ago today, the Dodgers continued their 2014 opening series by picking up their second consecutive victory over Arizona, 7-5, in Sydney, Australia. Yasiel Puig and Juan Uribe each had a double and three hits while Andre Ethier added two hits and an RBI. On the mound, left-hander Hyun-Jin Ryu tossed 5.0 scoreless innings for the victory. The Dodgers’ one-and-only off day of the spring falls tomorrow. Left-handed pitcher Brett Anderson will participate in a minor league game on the back fields at 1:00 p.m. to stay on schedule. THEY SAY IT’S YOUR BIRTHDAY: The Dodgers would like to wish a very happy birthday to Joel Peralta, who turns 39 today! Peralta is in his first season with the Dodgers after spending the previous 10 seasons with the Angels (2005), Royals (2006-08), Rockies (2009), Nationals (2010) and Rays (2011-14). The native of the Dominican Republic was acquired on Nov. 20, 2014 with Adam Liberatore in exchange for Jose Dominguez and Greg Harris. Peralta hold the Rays’ all-time record for appearances with 296. MEDICAL MINUTE: Yesterday, Dodger left-hander Hyun-Jin Ryu left Camelback Ranch for Los Angeles, where he will meet with Dr. Neal ElAttrache today. Ryu has been experiencing discomfort in his left shoulder and received an inflammation-reducing injection on March 18. Fellow left-hander Erik Bedard will have an MRI this morning after suffering what is believed to be a lat strain in San Antonio. THE LEGEND: Former Cy Young Award winner and current Special Advisor to the Chairman Don Newcombe is at Camelback Ranch this week! Newcombe, who won the very first Cy Young Award in 1956, is making his annual visit to Dodger Spring Training and will throw a ceremonial first pitch prior to Friday’s sold-out game against the Giants. 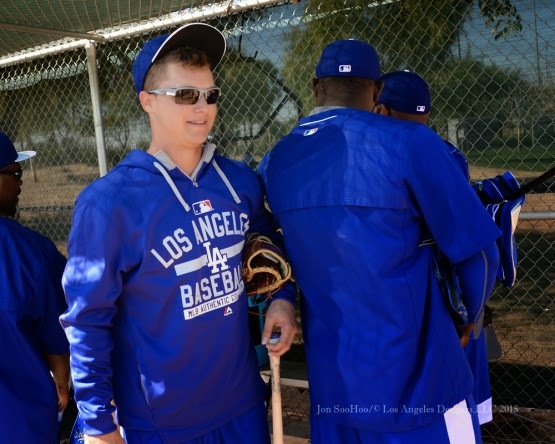 SUCH A JOC: Joc Pederson has posted a .436/.476/.769 slashline this spring and continues to rank among the NL leaders in runs (10, T-1st), hits (17, T-1st) and total bases (30, 2nd), on-base percentage (.476, T-3rd) and slugging percentage (.769, 1st). Pederson also ranks second in the NL in batting average, trailing only Arizona’s Ender Inciarte (.472). Justin Turner has homered in consecutive games, posted four consecutive multi-hit games and also hit safely in 10 consecutive contests dating to March 8. He’s batting .469 with four doubles, two homers and six RBI, while posting a .485 on-base percentage and a .781 slugging percentage in 12 Cactus League games. 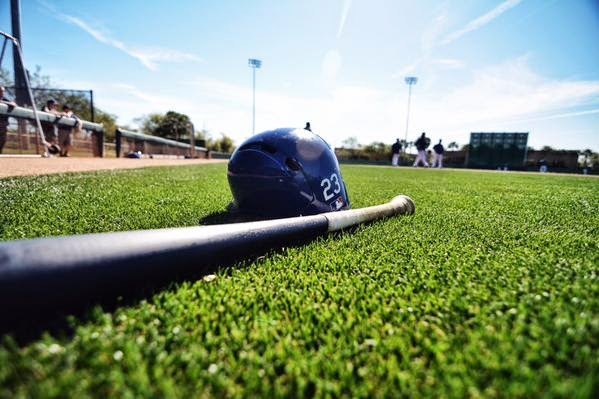 The Dodgers have been going deep at a frenetic pace of late and now lead the Major Leagues with 33 home runs this spring, four more than the Chicago Cubs. The club is led by Yasiel Puig, Joc Pederson and Kiké Hernandez, who all have three. CAN’T FLY SOLO: The Dodgers lost to the Indians, 4-2, yesterday at Camelback Ranch, getting solo homers from Yasiel Puig and Kiké Hernandez as their only offense of the game. The club was limited to five hits and managed just three in 5.2 innings off of American League Cy Young winner Corey Kluber. On the mound, left-hander David Huff tossed 3.0 scoreless innings and allowed just one hit while J.P. Howell (1.0 IP), Paco Rodriguez (1.0), Yimi Garcia (1.2) and David Aardsma all tossed scoreless relief. Garcia has now fired 7.1 scoreless frames with nine strikeouts this spring. ON THE MOUND: 22-year-old RHP Chris Anderson will make his third Cactus League appearance today. He has allowed one run on one hit through 3.0 innings so far this spring. Anderson was the Dodgers’ top pick in the 2013 draft and has averaged 9.8 strikeouts per 9.0 innings during the course of his career, striking out 196 batters and walking 87 in 180.1 innings. Hard-throwing LHP Adam Liberatore is expected to make his seventh appearance of the spring today. Through six Cactus League appearances, Liberatore has tossed 6.0 scoreless innings, surrendering only three hits and striking out six. LHP Daniel Coulombe is also expected to see action today. Coulombe has held opposing hitters to a .063 batting average this spring, allowing only one hit in 4.2 innings. RHP Sergio Santos will make his seventh appearance after tossing a scoreless inning of relief in last Friday’s loss to Colorado. RHP Pedro Baez will see action today, for the sixth time this spring. The native of the Dominican Republic has held opposing hitters to a .200 batting average and struck out five through 4.0 innings of work.